A Traineeship is for young people aged 16-17 in Wales; although if you are aged 18 and have left school or college you could also apply. You will gain the skills you need to get a job or progress to further learning at a higher level such as an Apprenticeship or Further Education. A Traineeship will give you the support, skills and qualifications you need to move into paid work, an Apprenticeship or to go into learning at a higher level. Also, what you learn will look good to employers. Traineeships have three different levels to make sure that you get the support and backing you need to progress: ‘Engagement’, ‘Level 1’ and ‘Level 2 - Bridge to Employment’. Lots of people start here. This is for you if you are not sure what you want to do for a career or if you need some support to take part in employment or other learning. It will prepare you for the world of work or full-time learning. How many hours a week will I do? Between 12 and 21 hours for the first 4 weeks, then between 21 and 30 hours. This will be agreed by your careers adviser and the training provider when you meet them. You can start at this level. This is for you if you know what career you want to follow and have the ability to start learning at Level 1. Work experience and a Level 1 qualification in the subject you have chosen. Your work placement could also become a permanent job. You can start at this level if you have finished Level 1 and are ready for full-time employment. You will also need to either be employed or have an employer who is prepared to give you a job. A Level 2 qualification in the subject you have chosen, gained while you are working. As agreed with your employer. 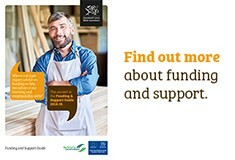 You need to see a Careers Wales careers adviser. If you are still in school, see your Careers Wales school adviser. They will help you to decide what you want to do after you leave school. If you have left school contact Careers Wales for an appointment with an adviser. They will talk to you about your options and what you would like to do. They will be able to refer you on to a Traineeship programme. Or call Careers Wales Connect on 0800 028 4844. Lines are open between 9am and 5pm Monday to Thursday and 9am - 4.30pm Friday.